In her 25 years of working life, Katy Baird has done just about every service job going: she’s sold burgers, booze, drugs; she’s microwaved mashed potato at Wetherspoons, smiled welcomingly at Burger King and taken requests on webcams. Workshy is her messy, anarchic and very funny solo show about working to live, and how what we do all day long makes us feel. Not that she’s talking too directly about it: Workshy is more light-touch than that. On the surface, it’s all just stories, told as calmly and straightforwardly as if you’re in the pub together. This is a hugely watchable show that speaks softly instead of shouting. Baird, meanwhile, has the true performer’s knack of making everyone feel welcome and at ease: she sings, she surveys the audience, she makes us laugh, eventually she goes further than we want her to, to entertain us. 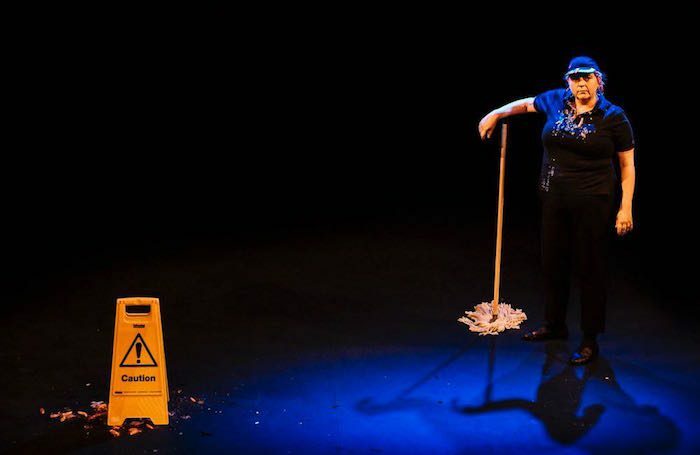 As Baird performs – re-enacting previous jobs she’s had, handing out food, pouring pints – Workshy becomes a fascinating meditation on ‘serving’ other people, and on the transactional relationship between performer and audience. This is smart, accessible performance art from a writer-performer with buckets of charm and ketchup.